If you’re not optimizing your social media strategy, you’re going to see limited success in the space. It shouldn’t surprise you an Ascend2 survey found 49% of digital marketers say social media is the most difficult type of marketing to execute, which might be the reason you’re here. But it’s important to know that 43% also believe social media is the most beneficial. Jump to the Social Media Best Practices Infographic. Each network provides unique outlets to your audience. How you use and set up your social media themes gives viewers insight into what to expect out of your channels. For example, some of the most popular businesses on social media have a specific theme or notoriety for their channels. 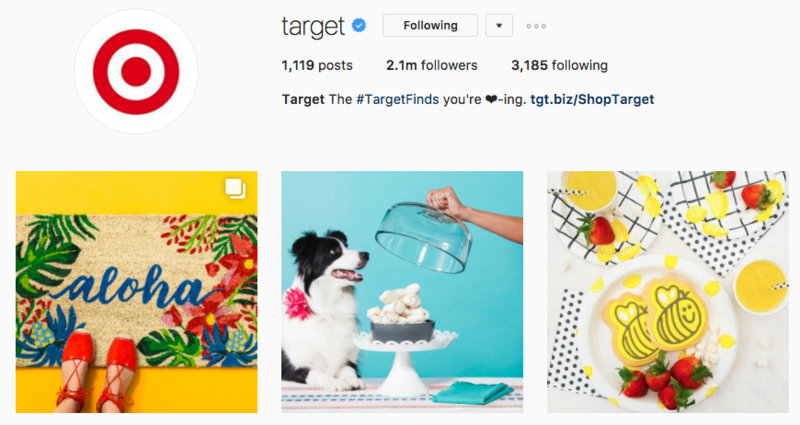 Target highlights it’s bright and summery colors on Instagram, but this doesn’t mean each channel has to be exactly the same. In fact, it’s much more the opposite. Most businesses prefer to use Twitter as a social customer care tool, while Instagram is more for creative, audience building techniques. Casper: Casper effectively uses Twitter to Tweet comical and fun messages that all revolve around one central idea–sleep. The mattress company excels at driving awareness by being a source of humor for fans, customers or potential customers on Twitter. AskPlaystation: Another expert on Twitter is Sony’s Playstation. The company uses multiple Twitter accounts for different needs. However, its customer support channel, AskPlaystation, cuts out the noise of promotions and gives users a direct path to troubleshooting issues, network downtimes and updates. Airbnb: This unique vacation rentals brand uses Instagram to visually highlight its more extravagant rentals across the world. Each listing is actually available and listed on a special landing page, which is clickable through Airbnb’s profile. Microsoft: The computer giant successfully uses Facebook to promote internal and external blogs on its Page. However, they also use Facebook to promote news and other industry events related to Microsoft. So now you know the brands doing it right, but how can your organization fit in without completely copying their theme? Luckily there are several content types to help boost your visibility and help engage your audiences at the same time. Encourage users to submit their own content to post on your Instagram account. Urban Outfitters regularly uses Instagram to promote various levels of user-generated content. This helps boost trust in your community and shows there’s a human behind the username. Brands like Casper, Denny’s and Hamburger Helper rely on being the comedian among the crowd on Twitter. Just look at what Wendy’s is doing with their fan asking for a year’s worth of free chicken nuggets. However, there are huge pitfalls to this theme, so be cautious. What’s one of the best ways to garner a response from your audience? Ask questions! It’s simple and easy to do whether you’re on Facebook, Twitter, LinkedIn or even Instagram. Just remember to be present and ask thoughtful questions that will actually drive engagement. Instagram is perfect for brands to take users behind the scenes of their company. Instagram Stories is the ideal tool to show your audience a more raw and authentic real-time look into what makes your business unique. How do some Instagram accounts have hundreds of thousands of followers without selling anything? More likely than not, their content is highly visual and absolutely engaging. If you don’t have an artistic eye for Instagram, find someone who does. So most people know your business name, but do they know what you do? Use unique product shots or customer testimonials to showcase your brand in a new light. GetStat, a search analytics tool, uses GIFs and industry stats to highlight unique findings for users. Defining your social media personality isn’t uncommon, but you must keep it consistent. Maintaining your brand voice helps boost engagement, trust and reliability. Without consistency, you give a lot of room for error in communication between your brand and customers. In fact, an Oracle report found 43% of social media users only interact with brands to get a direct response to a question or issue. This means people will often come to your brand for a simple question or concern. The key is to be consistent with your brand’s messaging and voice. Why are users so cautious with your brand? It’s due to the fact so many people have felt tricked or swindled about information on social media channels. Contently found roughly 66% of internet users have felt deceived by a brand through sponsored content, video or social post. You lose the trust of your audience when you change your brand voice and you’ll see it first in your follower count. 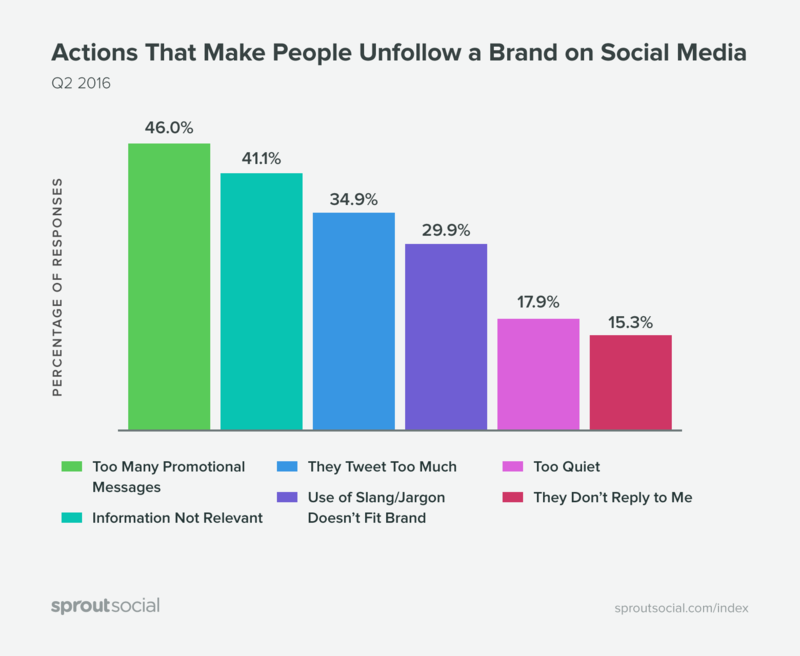 Our Sprout Social Q3 2016 Index discovered 41% of social media users have unfollowed a brand due to posting irrelevant information. This means you have to diversify your content without being too promotional. As we mentioned before, there’s a thin line between being a comical and offensive brand online. One way to avoid being in the news headlines for your social media is to not jump on the latest trends before doing your research. Unless you manage social for companies like MTV or Teen Vogue, your brand really has no business using trendy slang or internet terms. This makes you seem out of touch and hurts engagement. Don’t believe us? 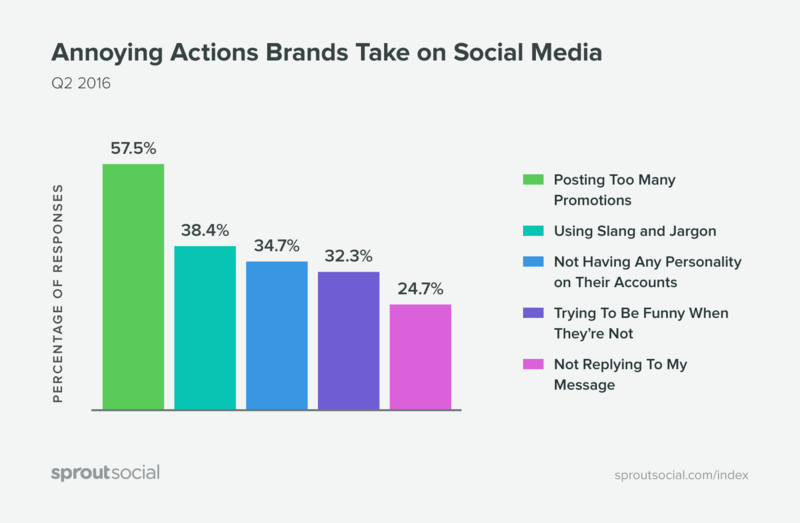 The same Sprout Q3 index discovered 38.4% of social media users said using slang or jargon was the most annoying action from a brand. To add to it, 29.9% said they would unfollow a brand for using slang or jargon on social media. Being an embarrassing brand on social isn’t as hard as you think. The same index found 71.3% of people have unfollowed a brand due to embarrassment. It’s actually pretty easy to seem out of date on social, so always treat your audience with respect. You‘re out of touch with your demographics. This comes off as abrasive to several users. Most know they’re being marketed to, so respect your audience by avoiding gimmicks to reach them. You’re willing to risk funny for cultural insensitivity. You might not realize certain slang, jargon or social memes are meant for certain cultures. Abusing them for marketing purposes can turn off an audience immediately. You’re pretending to be something you’re not. It’s always a great social media best practice to be yourself. That means follow your brand values, know your core audience and steer clear of quick marketing ploys that could turn off your current customers. Competitor data provides insights into smarter decision-making and better strategizing. There’s no need for copycats, but researching and analyzing competitive analysis keeps you one step ahead. Having the right tools makes all the difference. 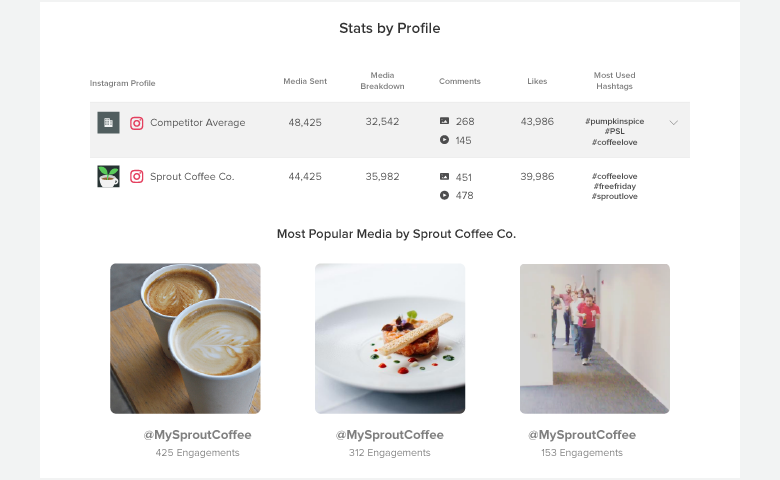 With Sprout Social, we provide in-depth competitor analysis tools for your most essential networks. Competitive analysis is essential to understanding your industry, who’s talking about you and who has the most engaged audience. Who’s Talking About You: Is it influencers, competitors or industry leaders? Monitor your brand and conversations involving you on social. Industry & Breaking News: What’s happening in your industry this second? Are you mentioned? Are your competitors? Content Driving Engagement: Is there a trend in your competitor’s most successful content? Is there a subject your industry can’t get enough of on social? Leaders in Shared Voice: Who leads the industry with the highest shared voice among your competitors? Media Sent: Total amount of content sent. Most Used Hashtags: Hashtags your brand has used the most. Likes: Total number of likes from all content. Comments: Total number of comments from all content. Engagements per Media: Total amount of engagements on average per post. Followers Gained: Total amount of new followers over a selected time frame. Follower Growth: Total growth of followers between a selected time frame. New Users Followed: Total amount of new users your brand has followed in a time frame. Last but not least, the most essential social media best practice is your willingness to engage. No one wants to talk to a robot or receive an automated message on social media. Engage with your audience and send real responses to interact and humanize your brand. 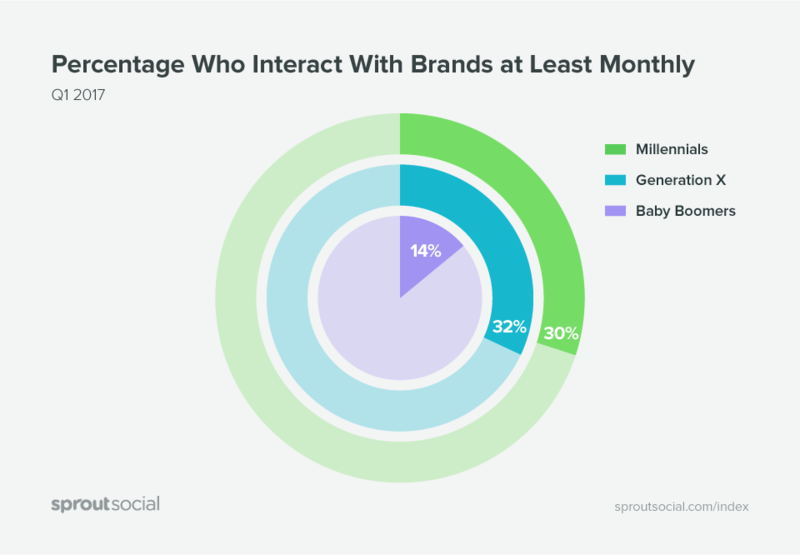 Our Sprout Social Q1 2017 Index discovered 30% of millennials engage with brands on social on a monthly basis. Younger generations are becoming savvy to the idea of directly reaching out on social to connect with brands. And it’s up to you to ensure people get a response. If you don’t respond, you lose money. Roughly 30% of social media users go to a competitor if you ignore their message. That’s important to know because 34.5% of people say social media is their top choice for customer care communication. That means you have to focus your attention on Tweets and Facebook messages to ensure your audience can interact and engage. Step 1: Give more to conversations than what’s asked from users. Step 2: Be entertaining with engagement but not over the top. Step 3: Inspire your audience to talk, engage and converse. Step 4: Listen more to those talking about you. Step 5: Provide resourceful information to your audience. Every social network is unique, but there are ways to be successful across them all. Following these social media best practices will not only help you get started, but also let current marketers fine tune their craft.